Animals can be tough on natural grass, pounding it to dirt or mud. As an XGrass partner, onelawn® delivers everything you need for a safe, clean, long-lasting space. Our team of professionals will ensure you get the perfect product, installation and maintenance schedule to keep your pet’s area looking and smelling great for years to come. onelawn® Pet Solutions is a low maintenance alternative to natural grass that provides a safe, mud-free playing surface with less downtime due to bad weather. Plus, it eliminates the need for harmful fertilizers and insecticides, minimizes exposure to pests and allergens and stays green all year round. Our solutions are specifically designed with synthetic turf made for pets. 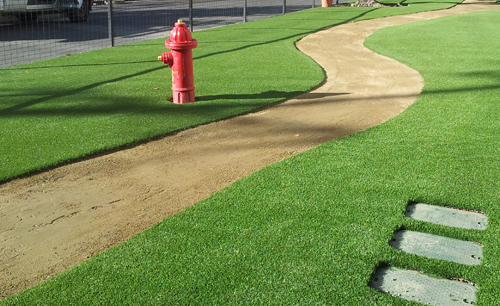 With TruFlo backing and installation, a unique infill system and proven odor treatment, it is quickly becoming the leading artificial grass for dogs on the market. The base layer is constructed with a clean aggregate base that offers lower costs and maximum drainage. onelawn® Pet Solutions can also be installed over an existing concrete or asphalt surface with proper pitch and drainage.